The season of goodwill and festive cheer is almost upon us, and now is the time to start thinking about entertaining, and your Christmas cheese and wine requirements from The Cheese and Wine Shop. When do I need to order Cheese for Christmas? We recommend placing your order as soon as possible; you can order Christmas Cheese from 1st October; and choose a delivery day as far ahead as January at checkout. Most Seasonal Cheeses will be available from Mid November, but please check best before and use by guides specific to each cheese and product. 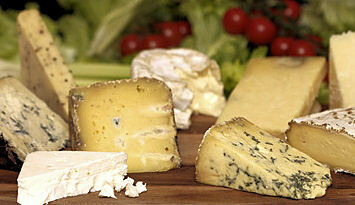 Please order early, AND choose a delivery date 1-2 days BEFORE you need them for cut cheeses. When should my Christmas Cheese arrive? Below is a "Generic" guide to the date your Cheeses will arrive with. When choosing your products, you can view the specific best before or use by date to assist you in making your choice. Click here for information on how to store your cheese. We recommend choosing the "Allow Substitutions" option at checkout to avoid delay in dispatch, and choose a AM Delivery slot. Please note that due to the sheer volume of orders we cannot guarantee a specific delivery date during Christmas period, although we will do our absolute best to meet your preferred date. A signature is required for delivery. Please specify any cheeses you do not want to be substituted with a similar cheese (and therefore omitted) if we are unable to supply the original. Buying Blue Stilton? See The Cheese and Wine Shops range here.